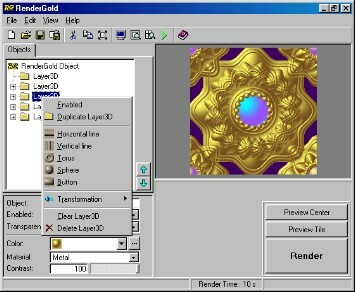 RenderGold is a computer graphic program which allows you to render 3D wallpaper and seamless backgrounds, 3D knots and rosettes, 3D buttons, bullets, decorative borders and other web graphics in unique jewelry style. The main idea of the program is the following: you use Objects Tree to compose a sequence of 3D objects and transformations. As a result you can get very interesting ornamental designs. The Help file of the program contains the Quick Start Tutorial section, that will allow you to begin work with RenderGold immediately. See Gallery to learn more what you can create with RenderGold. Get the latest version of RenderGold here. Gallery - The distribution package of RenderGold includes the Gallery folder with more than 300 files for study and use. Objects Tree gives you full control over all layers, objects and transformations of your project. Color Editor allows you easily to choose a color from list. Full screen preview allows you to see a result of rendering in full screen, centered or tiled. Set Wallpaper commands allow you to quickly change your desktop background to a rendered image, centered or tiled. Saving images - You can save rendered images in BMP (24-bits) or JPG formats. Saving projects - RenderGold has a native format (RG) with an XML-like structure to save your projects. RG files have a very small size and store a full information about all layers, objects and transformations. If you have created an interesting design in RenderGold, there is no necessity to write any tutorial for other users. Simply distribute your RG file, and any user can understand how it was created. Description - You can add a descriptive information into a RG file. Copy to clipboard allows you to copy a rendered image from RenderGold into other graphic programs. Copyright (c) 2001-2005 RenderGold Software. All rights reserved.